Today the Senate Energy and Natural Resources Committee marked up and approved S. 398, a bill that establishes new efficiency standards for a variety of consumer products: air conditioners, refrigerators, freezers, washers, dryers, outdoor drinking water dispensers, dishwashers, and a number of other appliances. You can certainly trust Congress to micromanage the optimal amount of energy used by hundred’s of complex small appliances across different industries. This bill saw national media coverage earlier this year when Senator Rand Paul ranted about efficiency standards that have effected toilets and will soon effect light bulbs. It’s infuriating that energy bureaucrats can claim that they are in favor of allowing consumers to choose whichever bulb they want, when they are setting bulb efficiency standards that will ban the traditional incandescent bulb. At least be honest about your desire to restrict the choices of consumer and our freedoms. Politico covered today’s hearing and Paul was unsurprisingly one of the few dissenters. This time Senator Paul offered an amendment that would make the energy efficiency standards voluntary, which failed 16-6 in committee. Here is a short video from Paul’s office covering the hearing. Consumers should be wary when business gets together and supports these types of standards, though the environmentalists often use this as evidence that only ‘crazies’ oppose such bipartisan, “sensible” legislation. These regulations will increase the cost of these appliances (and the profitability of them), create new competition-crushing barriers to entry, and often bring unexpected consequences (and here). Recall that a number of oil and energy companies supported the Waxman-Markey bill after it went through the Congressional pork factory. Proponents will also make grandiose claims about the amount of energy/jobs/money/small children saved from this legislation. These studies almost never consider the efficiency gains that companies might pursue on their own, assuming that the products will remain stagnant in water or energy usage for the rest of time, despite historical evidence (and common sense) to the contrary. 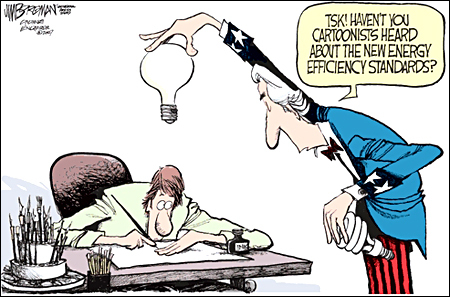 And who really believes that bureaucrats at the Department of Energy can calculate the appropriate amount of energy efficiency? After all, it’s not like Americans would prefer a refrigerator which adds $100 to their electric bill per year rather than $50, if everything else is equal. There is a natural incentive for companies to produce efficient products while also considering consumer demand. Here is a previous post from last year on efficiency measures. Here is a CEI press release on today’s decision. Here is a 2003 Cato Institute study on appliance efficiency standards from prior decades. Here is Representative Markey making the hilariously inaccurate claim that the GOP was responsible for ruining America’s domestic auto industry because of their opposition to fuel efficiency standards. an odd thought.. how many heads of the DNC have investments in the "green" light bulbs?